Visit this guide's GitHub repo for a collection of useful sample scripts. Contributions are welcome! 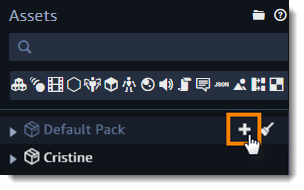 Create a blank asset by clicking the plus icon next to the default pack and then click Script. Select the pack name to see the icon. Press j to open the text editor. Choose the new script under documents. Use the pencil icon next to the script name to change its name. The script template includes 7 methods and a parameters array. The methods correspond to a scene's lifecycle events and are called by the engine at the following times. setup – When scene playback starts. fixedUpdate – On every physics update. update – On every render frame. lateUpdate – After calling all update methods in the scene. enter – On a state machine script action, when the state is entered. exit – On a state machine script action, when the state is exited. cleanup – When scene playback stops. Reference documentation for the Sumerian engine library is available on the Sumerian website.